Winters in Utah and Idaho brought snow and snow often demanded an alternative means of transportation for moving people, goods, crops and machinery around. The bobsled was the technology that fulfilled this need. The basic bobsled undercarriage shown above was used in many ways. They were used as shown to haul logs. Wagon beds were set on top and used to haul hay, grain and other crops. And closed boxes with windows and a stove were set on top and used for school busses. The bobsled was a standard fixture on early farms in Idaho and Utah. In the picture above is a sheepcamp mounted on a bobsled. This was a common method of winter travel since the sheepcamp had a stove inside that could be fired up to fend off the cold. 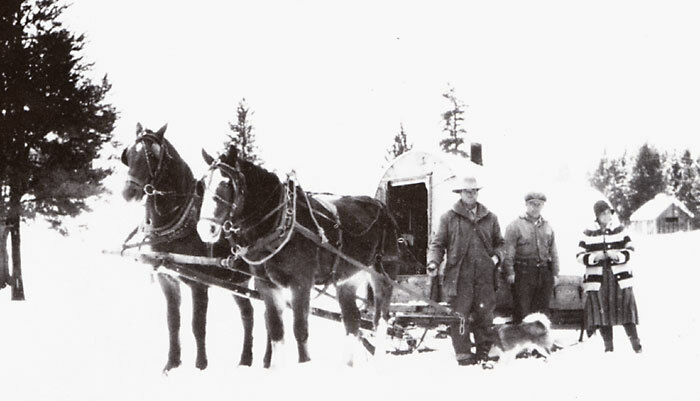 The bobsled was the winter wagon, used for hauling everything over snow and ice. 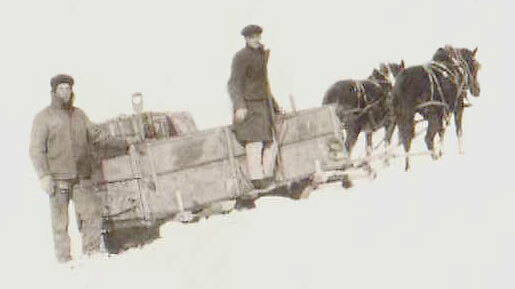 Bobsled with wagon box being used to haul cargo in over snow in cold weather.